The combination of strong northerly winds and New Moon high tides has not been kind to the beaches, businesses or others along the Hervey Bay foreshore over the last few days. While some of the spots have seen beach erosion become even worse other spots such as the Pialba area have seen even more sand dumped by the incoming tides. Late last week the Council had an excavator working at the mouth of Tooan Tooan Creek clearing sand to allow the creek to be flushed at high tide but most of the sand is now back and down at Shelley Beach the tide and winds brought in something quite different. 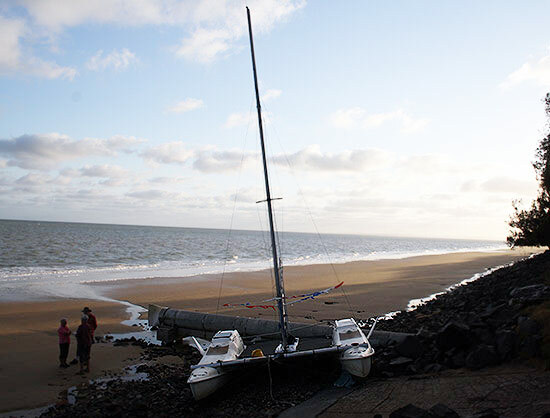 This catamaran had been anchored off the beach for some weeks but the combination of tide and strong wind was too much for the anchor and when the sun came up on Monday morning there was the vessel was high and dry on the rocks. While the vessel had obviously sustained some damage it had been removed by Monday afternoon. 14/07/2014. Just watched the local channel 7 news re paying for parking in Hervey Bay. If the council go ahead with this inane proposal they will find they are a one term council. Councils are elected to serve the community, and this proposal does not serve the community. I’m sure the entire retail business of Hervey Bay will or should be up in arms about this stupid proposal, especially those in tourist areas. If council needs to generate a better balance sheet, which is expected of them, they should be looking at existing expenditure and ways of reducing that expenditure. But at the end of the day councils should be running a balanced budget, not trying to make a profit. Commercial business needs to make a profit to stay in business, councils need to be keeping cost to residents to the minimum. This council has a record of wasting money through hasty and ill thought out policies. I’m retired now but in my commercial career I was always of the view “would I do this if it was MY money”. This gives one pause and reflection before committing to new projects/expenditure. We retired to Hervey Bay, like a considerable percentage of the local population, to escape these inane ideas by councils in the major cities. Fraser Coast Council anf Gerard O’Connell in particular wake up to your-self’s and consult with your electorate before announcing these stupid ideas. If you ever needed an example, just look at the initial permission to operate a helicopter flying school from Hervey Bay airport. I spent the last 30 years of my working life in aviation and it was obvious to me that decision was made without any knowledge whatsoever of the ramifications.